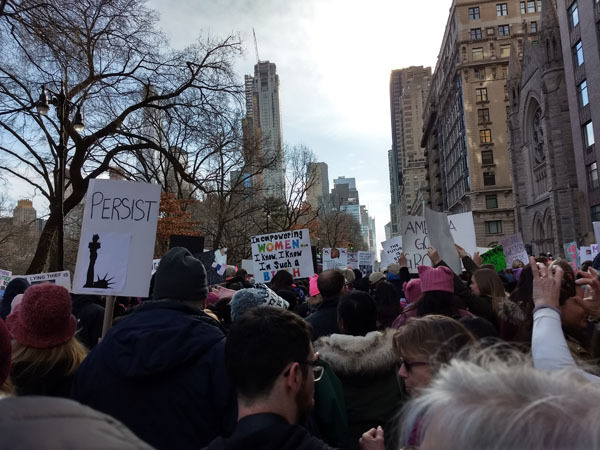 My husband and I went to the NYC Womens March on Saturday along with 200,000 other people. The weather was great after our weeks of Arctic Chill, and the crowds were just as wonderful as last year. Both years I was impressed with the comraderie, and the lack of conflict People were genuinely happy to be marching. Husbands marched with wives. Parents brought their children. And everyone waited patiently in large crowds even to get on the main march route down Central Park West. 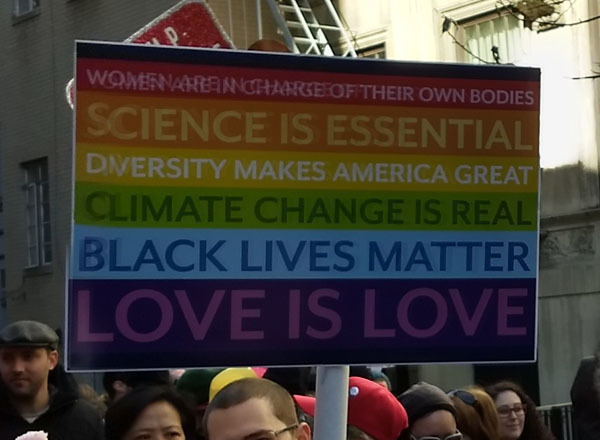 After the Womens March in NYC in 2017 and the Science March in DC in 2017, I am so impressed with the number of truly creative signs, all of which express our dissatisfaction with this administration. Here are a few of the photos that I took. 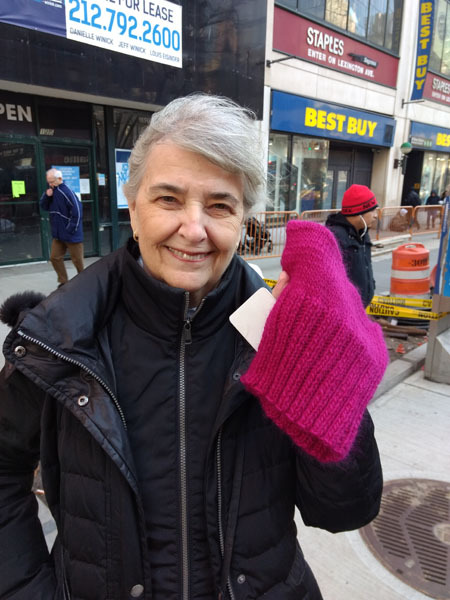 Waiting for the bus to the Upper West Side. 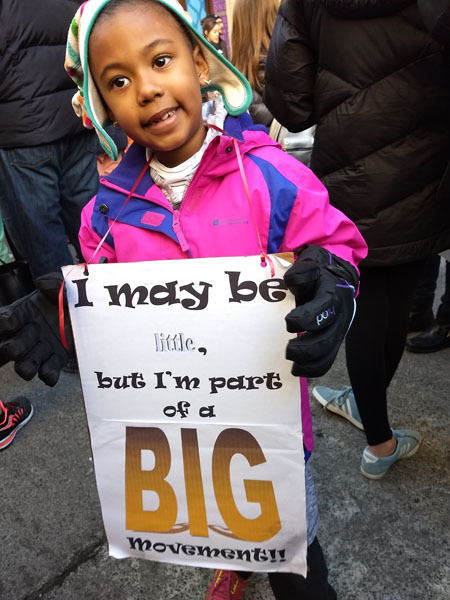 After last year's Womens March I sent it to my Grand daughter in DC, and then needed to borrow it back from her for this year. 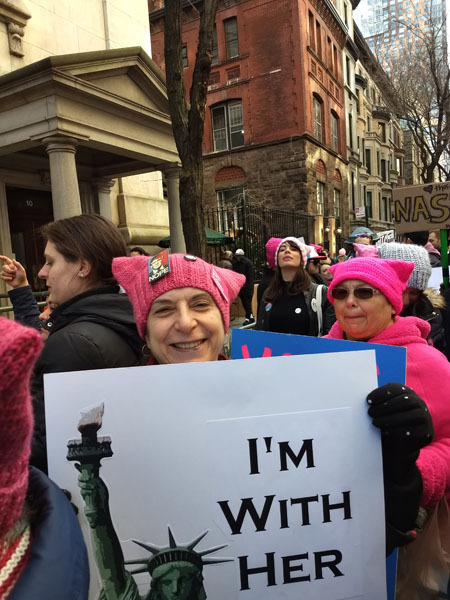 Beginning with "Women Are in Charge of Their Own Bodies," this sign says it all for me! 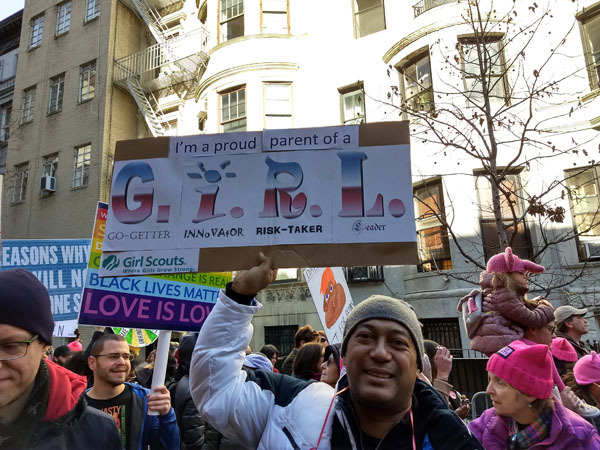 This Father marched with his little girl - and he is carrying a sign with sponsorship from the Girl Scouts. And here is his little girl. By chance I met one of my favorite friends - Robin - who is part of my 4 person Quilt Bee. Her sign of course is the Statue of Liberty. After more than an hour waiting on W68th St., we were fed into the main March route on Central Park West. This was again an amazing experience! And I will turn out every year to make sure that the world knows that we are no longer proud of our country, and will resist and persist. 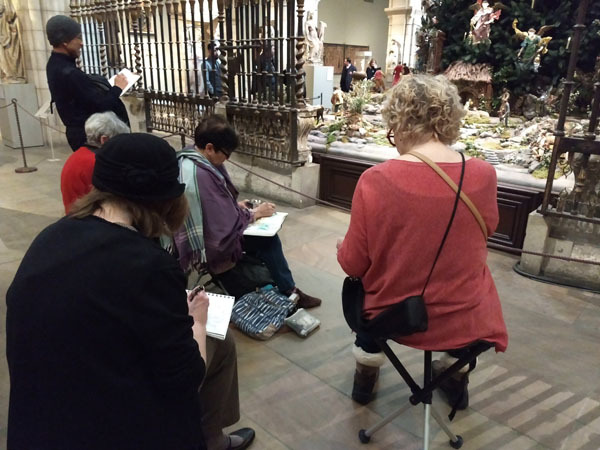 The NYC Urban Sketchers met on Wednesday this past week in order to draw the Christmas Tree in the Medieval Hall at the Metropolitan Museum of Art. The ornaments were made in Italy and are ceramic and fabric, with lush silks for garments. We listened to wonderful choral music while we sketched. 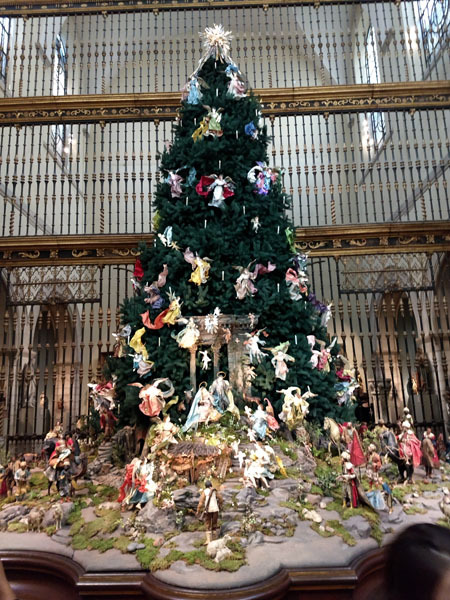 Unfortunately you can't get close enough to the tree for detailed drawings of the angels, but can see all of the sculptures around the base of the tree slightly better. 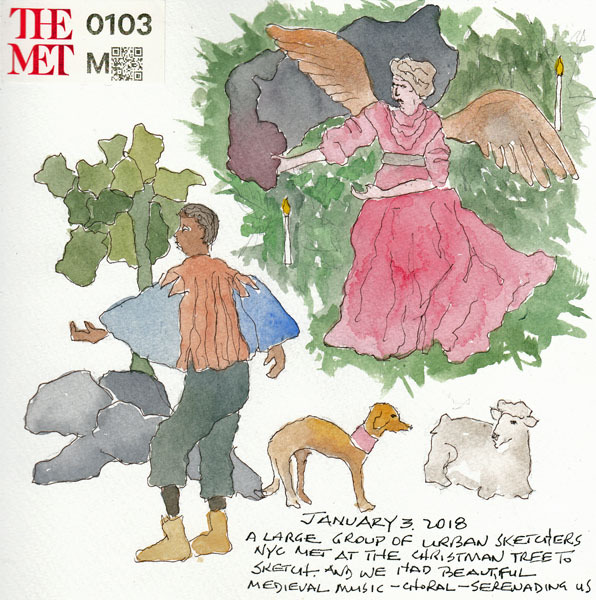 This sketchbook page is a painting of one angel and a few of the figures around the base. Some of the Urban Sketchers at the back of the tree - busy drawing. 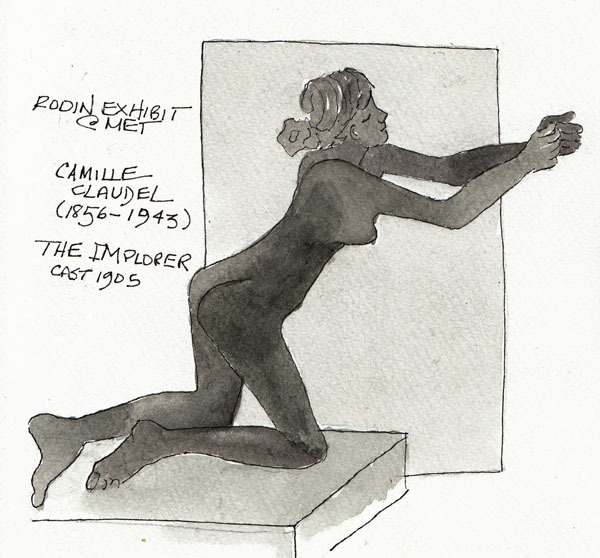 After drawing at the Tree, I went upstairs to the Auguste Rodin exhibit and painted a sculpture by his mistress and muse, Camille Claudel. There are so many small Rodin scultures in this exhibit, that I hope that I have time to sketch more before it closes on January 15th. Manhattan is a Christmas Wonderland each year, especially 5th Avenue from 42nd Street (Bryant Park) to 59th Street (Bergdorf Goodman). 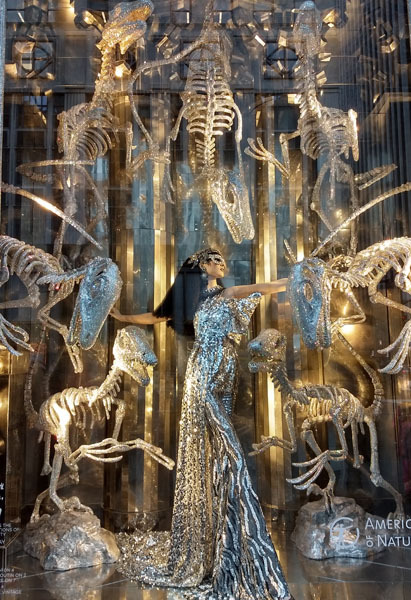 Bergdorf's window decorations are always spectacular, and this year each window represented a cultural institution in NYC. The American Museum of Natural History window was my favorite. 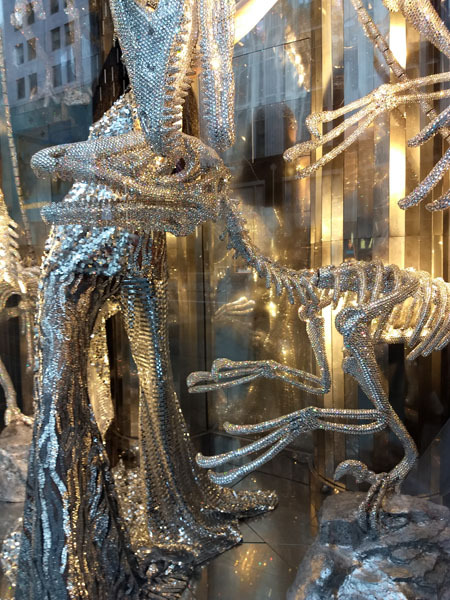 This photo has way too many reflections, but you can see that a model is surrounded by jewel encrusted dinosaurs. Detail: Every inch of the "sculptures" are "jewel encrusted" on every square millimeter of their body. It was dazzling! 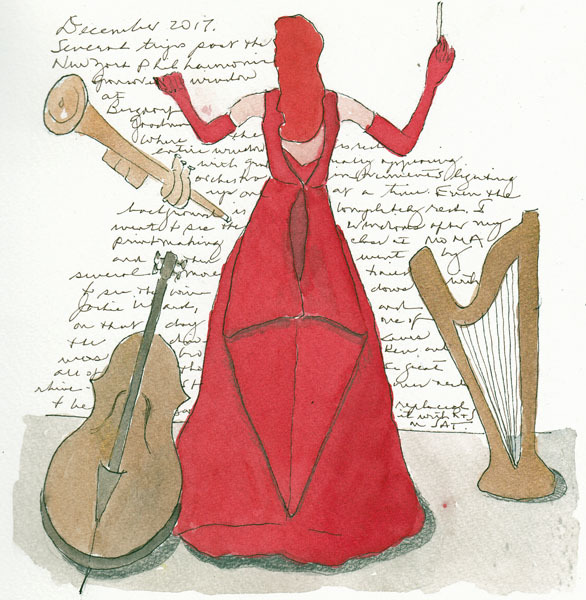 On one of my walks past all of the Bergdorf windows, I stopped to sketch the NY Philharmonic Window, and painted it at home. It was totally red, with neon musical instruments filling the background. This morning we took down our Christmas tree, with an outside temperature of 10 degrees and a wind chill of -12. The Holiday season is officially over in our apartment as we try to deal with the Artic freeze and almost 8 inches of snow yesterday. HAPPY NEW YEAR and may your lives in 2018 be filled with good health and wonderful art. 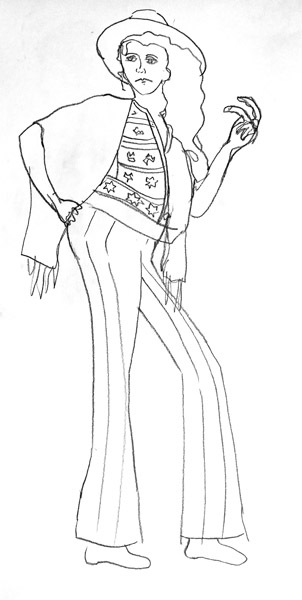 I loved this class and learned from a master fashion illustrator. This week was our last class, and we had 3 models, and many quick poses. While we were sketching Professor Salek, as a final review, talked about all of the skills she presented during the semester. 1. The angle of shoulders and hips - which are usually opposite in direction - and should be exaggerated. 2. To be bold drawing the shapes. 3. To start drawing from the head and then to proceed down the figure, switching from side to side. 4. To elongate the drawing and narrow the form. 5. To pay attention to opposition, which to her means don't draw both sides of an arm or leg with identical lines. Exaggerate differences. I wish I had erased the hand on the first figure - but maybe my new Craftsy class on Drawing Hands will help me as 2017 ends!! It is snowing right now in New York City for the 3rd time in 7 days. Trees are up everywhere and decorated. Skaters are enjoying all of the skating rinks. And I'm hoping for a white Christmas. My Grandson Callum loves to pick out an ornaments for me to make for our Grandchildren. I originally made this one in 1987, and we have one on our tree each year. 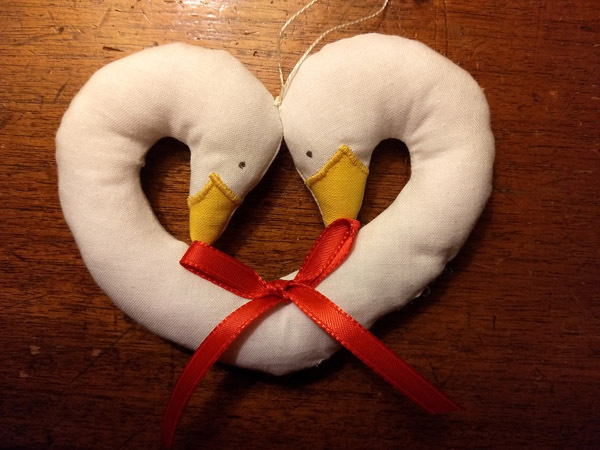 Yesterday I listened to NPR and made 9 Geese Hearts between 10AM and 7PM! 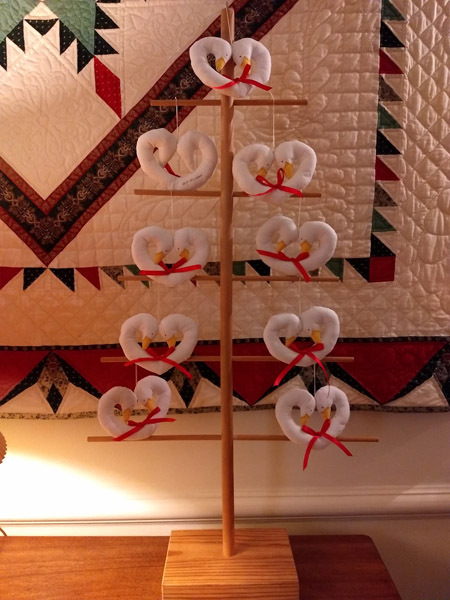 The Geese are hanging today on my Swedish Christmas tree until our grandchildren come over for dinner tonight. Then Sydney and Charlie will decorate (i.e. refill) the Swedish Tree with small ornaments from a group project I had with my quilting friends in San Antonio. This was a pattern from a McCall Christmas decorating pattern and remains a favorite. Our houseguest this week traced the pattern to make one for her daughter and son-in-law who were married in November.